The UPnP protocol was invented by Microsoft and saw the light of day in the late 1990s. The purpose of UPnP is to allow devices on a network to automatically discover and interface with each other. Microsoft chose to base UPnP on the hottest standards at that time, namely XML and SOAP (both introduced in 1998). XML and SOAP have since been criticized for their verbosity and complexity. Making it possible to both control and read the state of my home speaker system using UPnP. Keeping the binary size and RAM usage low enough for the library to run on Arduino boards using the ATmega328 chip. Learning more about writing parsers, using PROGMEM and the UPnP protocol. It isn't feasible to implement the entire UPnP protocol on a device like the Arduino, and reading protocol specifications can be tedious. Therefore, for small projects like Sonos speaker integration, it's sometimes faster to use a tool like Wireshark to get an understanding of and replicate some of the messages being sent over the wire. 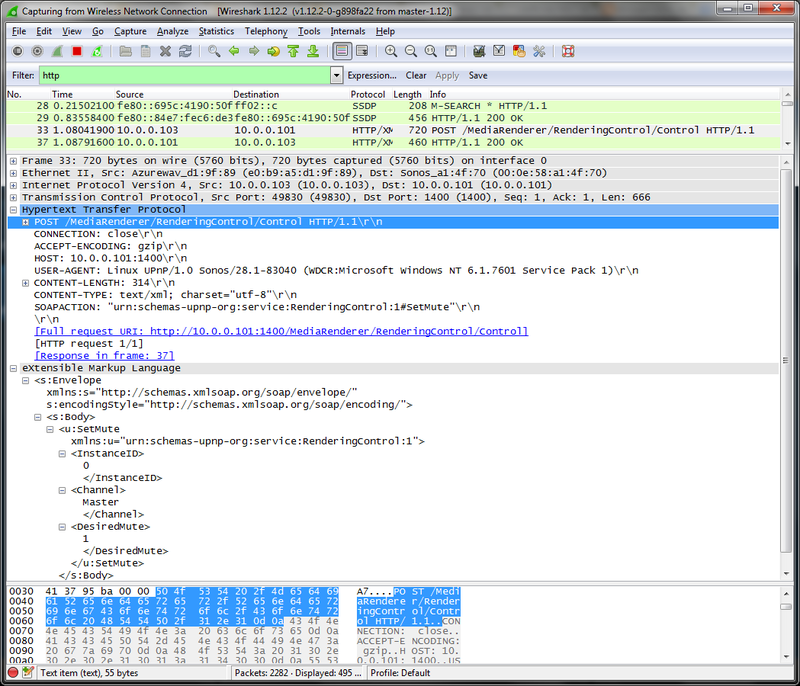 To get started with Wireshark: download, install, select capture interface and click start. Tip: Use the filter function. The Arduino Uno and Duemilanove boards use the ATmega328 chip with only 2048 bytes of SRAM. Normally when you use strings (char arrays) in your code, all the strings will get copied to the heap on startup and waste your precious RAM. Sending UPnP messages seems simple enough, but what about receiving and parsing? One of my goals when writing the SonosUPnP library was to support reading state in addition to controlling the Sonos speakers. This capability is also what sets my library apart from the other Sonos Arduino libraries I've seen so far. Hi! I really enjoyed your work. Did you publish it somewhere? Oh no, I mean a scientifc paper or something.. By the way, did you have an example using just upnp on arduino or ESP8266? I mean, the code that creates devices. I'm building such source code, see https://github.com/dannybackx/arduino-upnp . The code creates a simple device. Jeg har ikke sett på ESP8266, men det bør være relativt enkelt å skrive om koden slik at den fungerer på en annen mikrokontroller. Hvor mye RAM er det på ESP8266? Ta kontakt hvis du ønsker å bidra. Epostadressen min finner du i toppen av alle kildekodefilene som kan lastes ned fra GitHub. Is it possible to build a own sonos speaker with this library? this is a very gernic question. Sonos UPNP provides SOAP like messages to controll a speaker. You mihgt get inspired what and how to implement for a speaker. And just joking: you would also need some hardware. I just started to get your code running on an ESP8266. In general your code looks very good structured. and the ethernet client is strong coupled into the code. The setup of a Wifi Client looks a bit different. looks like there is a Ethernet.h implementation for the ESP8266. But I wonder how good that can work. I think I will start to replace the ethernet client. works with ESP8266 Wifi Client. It is funny to hear a norwegian radio station. code needs some clean up. and serial event seems not to work. but that is not part of that lib. gds, have you published the esp8266 code? not yet. I don't know a good way to do so. finally these are 10 line diffs to Thomas code. The best way would be to modify Thomas code, so it works for avr and esp8266. But this might get complicated. May be you (someone) can open a esp8266 branch. The other approach I copy Thomas code and replace some code to make it more efficient for the ESP8266. But I would have to ask him about it. I do not know about the culture for joint open source development. I'm interested for the code snipped also. can you handle a diff? Gds: thx for your code. I will check and test it in my implementation in the evening. This works fine at an Arduino Mega but not yet complete on a WeMos D1. #if defined ESP8266 is a valid approach. I hope for a more generic object oriented solution for different Clients. And buffer works but in combination with the loop and strlcpy ..
you end up in a lot of small wifi packets. For a proof of concept it is ok. But for publishing the code I would like to think twice and to rework it. Hi there, now the code runs on my WeMos D1 an the next step for expanding the code to deal with a cheap IR-Sender can be done. This is my first attempt to code on the ESP8266 platform and I've learnt that it's not a good idea to block the code in the main loop(). Great example which shows how to deal with the little complex protocol for controlling the sonos devices and gives examples for the most important commands. Sure, the code has potential for optimizing and can be beautified. But regardless, thanks to the author for sharing it. I'm looking to build a sonos controller using a WeMos D1, from your post it sounds like you have some working code. Any chance you could share a copy? Thanks just what I needed. Now I'm 95% there... only 1 small challenge remaining..
How do I select a playlist? I've read through documenttaion and looked at the examples and I can now select which radio stream i want and volume control plus play/pause is all working I just can't work out how to tell Sonos I want to play a specific play list. simplest way to figure that out: use the sonos sw-controler and monitor with wireshark the conversation with the box when you select and change the play list. Might be, that you need to construct a new message type in the lib. just start with ip address filter. Would you mind sharing the code? Oh, I have a new error. Arduino: 1.6.9 (Windows 7), Board: "Arduino/Genuino Mega or Mega 2560, ATmega2560 (Mega 2560)"
check where you have declared this function. might be you need a forward declaration in before that line. Hi, I'm trying to get trackinfo for my spotify tracks but the track URL is empty whenever I play a track from spotify. I've added a SONOS_SOURCE_SPOTIFY_SCHEME "x-sonos-spotify:" and a SONOS_SOURCE_SPOTIFY 6 etc. I really enjoy your library for Sonos! However, I am missing one part and there is one thing that doesnt work. Maybe because of updated Sonos players? 2. I cannot get the group and ungroup of players to work. I have tried all sorts of combinations, but nothing happens when i group the players (or ungroup). Is it something you can look into?